With apologies to our favorite customers in the South (or maybe just envy), we thought we’d take a look at a more Northern subject this week: keeping warm in winter. Earlier this week, most of New England was having a bit of an arctic blast with temperatures plummeting well below zero and windchill factors increasing the regional penchant for indoor winter activities such as watching the Golden Globes and playing with the Benedict Cumberbatch Name Generator. We seem to be having a proper New England winter this year, so we are beginning to wonder about our feathered friends out there at the feeder. How do birds keep warm in winter? We dress in layers starting with comfortable and colorful t-shirts, of course, but how do birds do it? Like us, birds are warm-blooded – which almost always means that they have to work to keep themselves warmer than their environment. They do this in primarily the same ways we do using feathers (layering), huddling, and fat reserves. 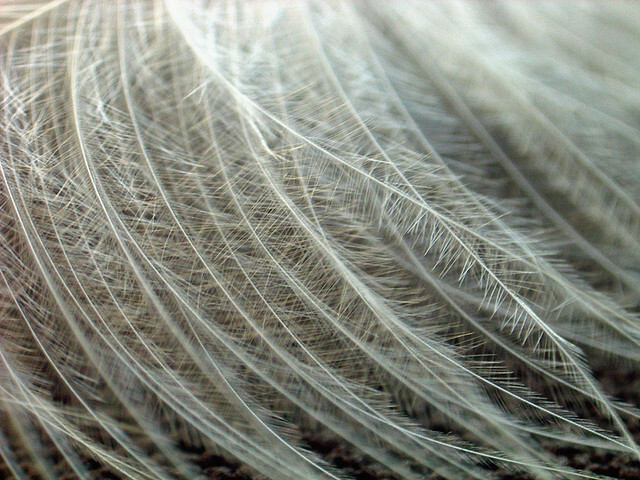 Like multiple layers of clothing, bird feathers are terrific insulators. Downy feathers, just like cotton fibers, are great for trapping pockets of warm air next to the body. When birds puff up, they trap even more warm air. We do this by adding another shirt to our ensemble. Huddling is something we do, too (though sometimes we call it cuddling). By scooching close to one another (imagine sitting with a friend at a hockey game, believe me, you are going to scooch) birds consolidate their body heat and expose less of their surface area. At night many birds roost, or crowd together in tight places to share body heat (we do this, too, but this is a G-rated blog post, so we won’t go into it here). And finally, fat reserves. Birds store up on fat reserves early in the season. Even small birds can build up fat reserves “to serve as insulation and extra energy for generating body heat. Many birds will gorge during the fall when food sources are abundant, giving them an extra fatty layer before winter arrives.” (http://birding.about.com/od/birdingbasics/a/howbirdskeepwarm.htm) This is something we also do which may explain the prevalence of sweet fatty treats during Thanksgiving and the early winter holidays. Whether or not you agree that this cold weather “is for the birds,” we, like the chickadees and titmouse at the feeder, can do something about it. Keep warm.